Hallowell, Gerald. "Prohibition in Canada". The Canadian Encyclopedia, 02 March 2018, Historica Canada. 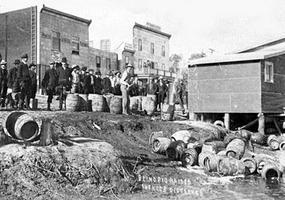 https://www.thecanadianencyclopedia.ca/en/article/prohibition. Accessed 19 April 2019. Hillhurst Presbyterian Sunday school group, Calgary, c 1912-16 (courtesy Glenbow/NA-1639-1). Prohibition was the result of generations of effort by temperance workers to close bars and taverns, which were the source of much drunkenness and misery in an age before social welfare existed. Temperance activists and their allies also believed that alcohol, especially hard liquor, was an obstacle to economic success, social cohesion and to moral and religious purity. 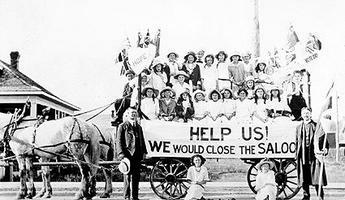 The main temperance organizations were the Dominion Alliance for the Total Suppression of the Liquor Traffic and the Woman's Christian Temperance Union, whose newsletter was the Canadian White Ribbon Tidings. The Temperance struggle was connected to other reform efforts of the time, such as the women's suffrage movement, and it was motivated in part by Social Gospel sentiments. Various pre-Confederation laws against the sale of alcohol had been passed, including the Dunkin Act in the united Province of Canada in 1864, which allowed any county or municipality to prohibit the retail sale of liquor by majority vote. In 1878 this "local option" was extended to the whole Dominion under the Canada Temperance Act, or Scott Act. By 1898 the temperance forces were strong enough to force a national plebiscite on the issue, but the government of Sir Wilfrid Laurier decided that the majority of 13,687 votes cast in favour of prohibition was not large enough to warrant passing a law, especially since Québec had voted overwhelmingly against the plebiscite. Much of the country was already "dry" under local option, however, and full provincial bans would eventually emerge. Prohibition was first enacted on a provincial basis in Prince Edward Island in 1901 and in the remaining provinces, as well as in Yukon and Newfoundland, during the First World War. Prohibition was widely seen at this time as a patriotic duty and a social sacrifice, to help win the war. 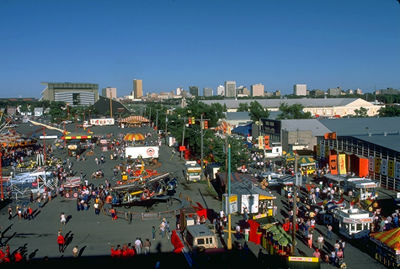 Unlike in the United States, banning booze in Canada was complicated by the shared jurisdiction over alcohol-related laws between Ottawa and the provinces. While the provinces controlled sales and consumption, the Canadian government was responsible for the making and trading of alcohol. In March 1918 Ottawa stopped, for the duration of the First World War, the manufacture and importation of liquor into provinces where purchase was already illegal. The provincial temperance laws varied, but in general they closed legal drinking establishments and forbade the sale of alcohol for beverage purposes and its possession and consumption— except in a private dwelling; in some provinces domestic wines were exempt. Alcohol could be purchased through government dispensaries for industrial, scientific, mechanical, artistic, sacramental and medicinal uses. Distillers and brewers and others properly licensed could sell outside the province. Although enforcement was difficult, drunkenness and associated crimes declined significantly. However, illicit stills and home-brewed "moonshine" proliferated. Much inferior booze hit the streets, but good liquor was readily available since its manufacture was permitted after the war. Bootlegging (the illegal sale of alcohol as a beverage) rose dramatically, as did the number of unlawful drinking places known as "speakeasies" or "blind pigs." One way to drink legally was to be "ill," for doctors could give prescriptions to be filled at drugstores. Scandalous abuse of this system resulted, with veritable epidemics and long line-ups occurring during the Christmas holiday season. A dramatic aspect of the prohibition era was rum running. By constitutional amendment, the United States was under even stricter prohibition than was Canada from 1920 to 1933: the manufacture, sale, and transportation of all beer, wines, and spirits were forbidden there. Liquor could, however, be legally produced in Canada (but not sold there) and legally exported out of Canadian ports. This created the odd situation of allowing smugglers to depart Canada with shiploads of alcohol destined for their 'dry' neighbour, under the protection of Canadian law. Smuggling, often accompanied by violence, erupted in border areas and along the coastlines. Political cartoons in newspapers showed leaky maps of Canada with Uncle Sam attempting to stem the alcoholic tide. Prohibition was too short-lived in Canada to engender any real success. Opponents maintained that it violated British traditions of individual liberty, and that settling the matter by referendum or plebiscite was an aberration from Canadian parliamentary practice. Québec rejected it as early as 1919 and became known as the "sinkhole" of North America, but tourists flocked to "historic old Québec" and the provincial government reaped huge profits from the sale of booze. In 1920 British Columbia voted "wet," and by the following year some alcoholic beverages were legally sold there and in the Yukon through government stores. Manitoba inaugurated a system of government sale and control of alcohol in 1923, followed by Alberta and Saskatchewan in 1924, Newfoundland in 1925, Ontario and New Brunswick in 1927, and Nova Scotia in 1930. The last bastion, Prince Edward Island, finally gave up "the noble experiment" in 1948. Pockets of dryness under local option would continue for years throughout the country.